I’ve been working on a lot of tedious Art Nouveau of late and, while I love it, I decided to indulge in this little project after hours to help me unwind from the seriousness of that particular style. I’ve been doing a lot of tabletop gaming lately, thanks to a friend who sucked me into a game of White Wolf’s Exalted setting. This fun side project began as an urge to draw the character from our Exalted game as well as to create cover art for a short story about her that I wrote. 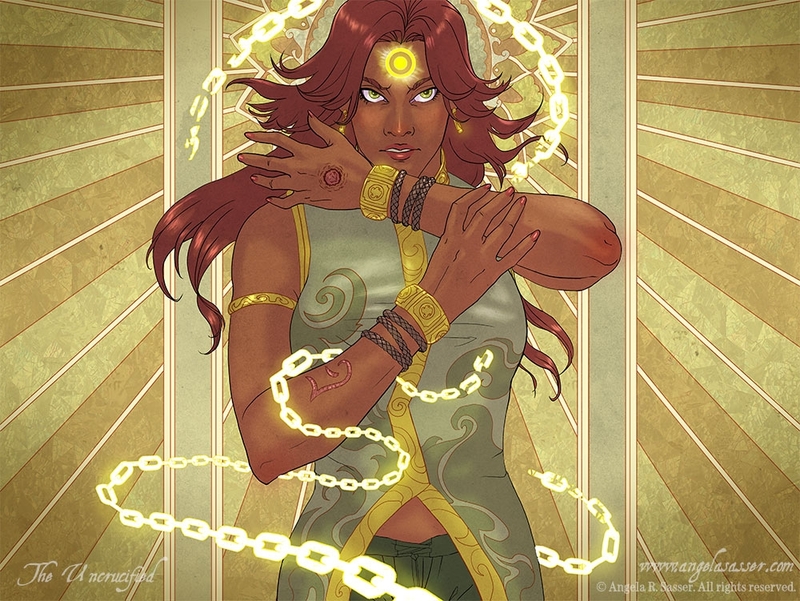 In our game, I play Kalara Vadras, a gunslinging Eclipse Caste, the diplomat of our Circle of players, and a no-nonsense businesswoman with a sordid past of betrayal and revenge. Here’s one of her early character sheets. I’ve been gathering references for our game for over a year. I love it when digital image hoarding pays off! 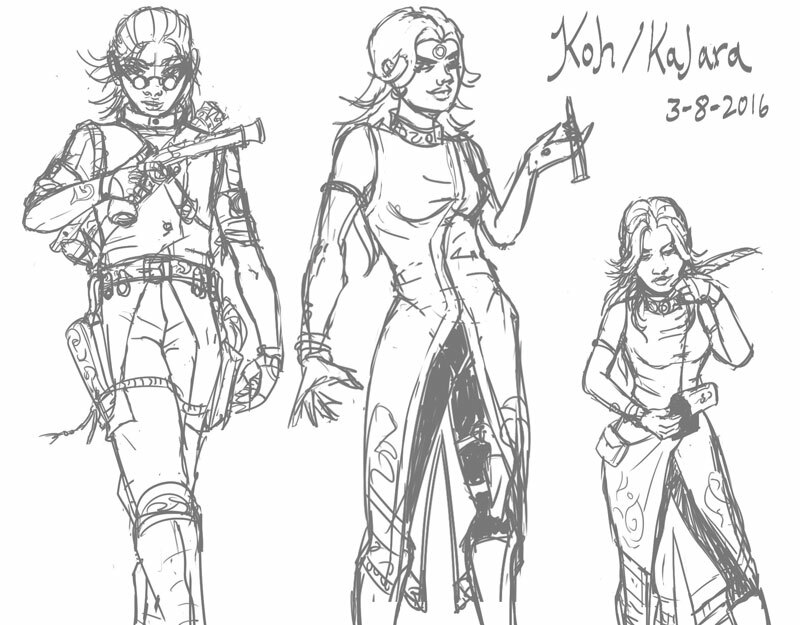 Kalara’s particular visual influences include Indian guns, Chinese fashion, and a generally non-Western collection of fantasy elements. Like this board? 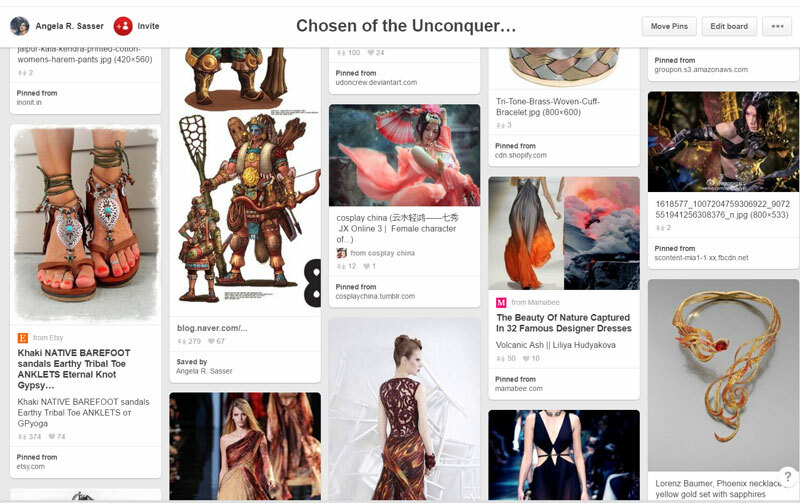 You can view and Follow it on Pinterest here! I also drew a lot of inspiration from one of my favorite comics currently being published right now – Monstress. 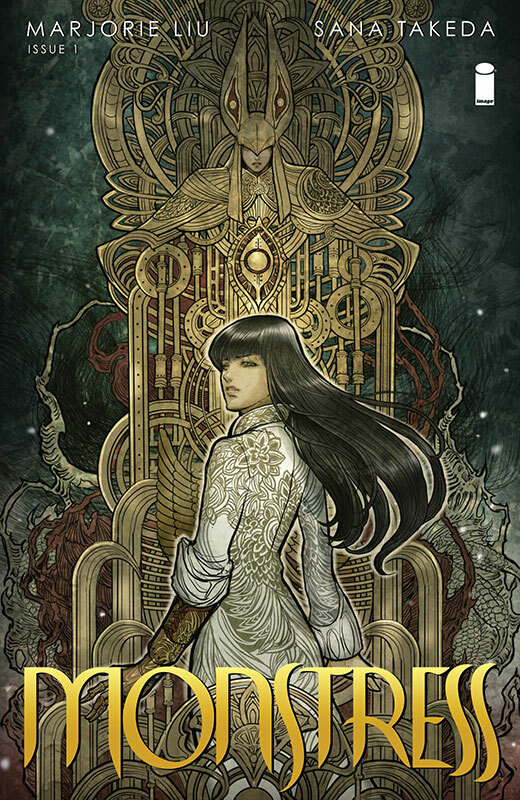 The art by Sana Takeda and story by Marjorie Liu are simply exquisite! The Asian Art Deco steampunk aesthetic fit so well with what my mind’s eye conjures while we play Exalted. 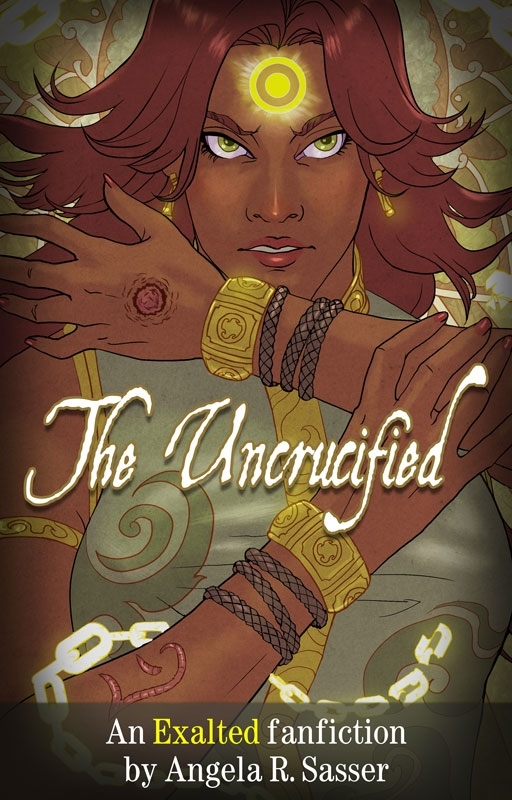 Check out the cover to the comic, you’ll see what I mean! Early on during the image’s sketch phases, I decided to push the image away from a detailed comic book style and more towards this anime-esque stylization thanks very much in part to Monstress’ influence. 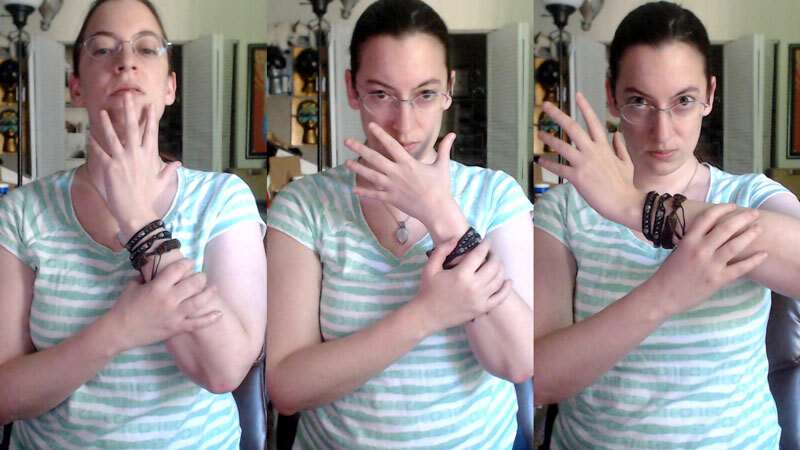 Next, I did a lot of posing in front of the webcam, as opposed to thumbnail sketches. This was meant to be a fast and fun image, so I decided to keep it simple and skip the planning step. While posing, I kept in mind that I wanted her very symbolic crucifixion scar to be very noticeable to the image, which meant focusing a lot on expressive hand motions. The 3rd pose on the far right ended up being my winner because of the diagonals that lead the viewer’s eye around. That pose also feels the most natural and emotive. Finally, here’s an animated GIF of my image’s evolution. You can can watch a more in-depth video about this piece’s creation at my YouTube channel. Prints and products of this piece are available at my Etsy shop! 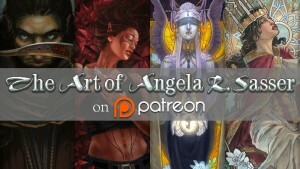 Like my art and want sneak peeks, special goodies, and more?